These beautiful waterfalls are situated between the Hee Khola and Bhalukhop. Each steps has a height a of about 300 – 400 ft. with clear visibility of all three falls from one point. It is fascinating and worth a visit. Journey to Hee Bermiok takes about four and a half hours from Gangtok. One can also reach there from Pelling. The main attraction are mountain biking, nature walk, visit to villages, Sirijunga Yuma Mangheem, Sirijunga holy cave at Martam , Mahatma Sirijunga Statue and Study Centre,Chhayatal LAKE (reflecting the image of the Sirijunga Statue), Phang Dorji Falls (Ban Jhankri Falls), Himalayan Botanical Garden Hee Goucharam, Hee Khola Water Garden, Red Panda Gate. The adventure lovers can enjoy two and a half hours trek to Barsey. Apart from having an Annual Tourist Festival, impressive village tourism facilities are available. 2 Kms trek from Sirijunga Yuma Mangheem, one comes across a waterfall besides which lies a cave, where Teyongshi is reported to have taken refuge. This Place is reserved by the Limboo community. 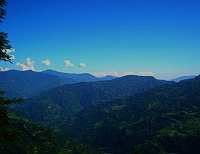 Situated at an altitude of 1700 meters, the drive from Gangtok to Rinchenpong takes about four hours via Zoom. It is also accessible from Siliguri and Darjeeling. It is picturesque village with beautiful landscape and a panoramic view of Khang-chen-dzonnga range. A visit to Resum Monastery is an interesting experience. One can also trek to Jhandi Dara/Melanpso, a rich forest area known to be the home of various species of wild animals and birds. Decent accommodation is available at Kaluk and Rinchenpong. A night spent in an old British Guest House or a new built Resort could be a memorable experience.